The AP-2 family of transcription factors consists of five different proteins in humans and mice: AP-2α, AP-2β, AP-2γ, AP-2δ and AP-2ε. Frogs and fish have known orthologs of some but not all of these proteins, and homologs of the family are also found in protochordates, insects and nematodes. The proteins have a characteristic helix-span-helix motif at the carboxyl terminus, which, together with a central basic region, mediates dimerization and DNA binding. The amino terminus contains the transactivation domain. AP-2 proteins are first expressed in primitive ectoderm of invertebrates and vertebrates; in vertebrates, they are also expressed in the emerging neural-crest cells, and AP-2α -/- animals have impairments in neural-crest-derived facial structures. AP-2β is indispensable for kidney development and AP-2γ is necessary for the formation of trophectoderm cells shortly after implantation; AP-2α and AP-2γ levels are elevated in human mammary carcinoma and seminoma. The general functions of the family appear to be the cell-type-specific stimulation of proliferation and the suppression of terminal differentiation during embryonic development. The AP-2 family of transcription factors (Ensembl Family ENSF00000001105) consists in humans and mice of five members, AP-2α, AP-2β, AP-2γ, AP-2δ and AP-2ε; frogs and fish have some of these proteins, and homologs are also known in invertebrates. The chromosomal locations and accession numbers of the family are given in Tables 1 and 2, respectively. All mammalian AP-2 proteins except AP-2δ are encoded by seven exons and share a characteristic domain structure (reviewed in ; for AP-2δ see  and for AP-2ε see [3, 4]). Orthologs show a similarity between 60 and 99% at the amino-acid level, whereas paralogs show a similarity between 56 and 78%. *The AP-2 genes of C. elegans and D. melanogaster are not orthologous to any of the five mammalian genes. Data taken from the database entries for the accession numbers given in Table 2. No information on mapping is available for the C. intestinalis AP-2 gene. *The AP-2 genes of C. elegans, D. melanogaster and C. intestinalis are not orthologous to any of the five mammalian genes. Analysis of the phylogenetic tree (Figure 1) reveals that the vertebrate AP-2 proteins are grouped together and are divided into five groups. The single Xenopus AP-2 is most closely related to mammalian AP-2α proteins. As the genes AP-2β and AP-2δ are found on the same chromosome in chickens, rodents and humans (Table 1), it is likely that they are the result of an internal duplication. According to the phylogenetic tree, AP-2δ genes appear to have separated from the rest of the family early in the vertebrate clade and to have evolved separately (Figure 1). A BLAST search of the puffer fish Fugu rubripes fourth genome assembly database  suggests that there are orthologs of AP-2α, AP-2β, AP-2γ and AP-2ε but not AP-2δ genes in bony fish, although only orthologs of AP-2α and AP-2β have been found in zebrafish. Phylogenetic tree of the AP-2 family. Amino-acid sequence alignments were performed using ClustalW implemented in Sequence Data Explorer of the MEGA3 software . The phylogenetic tree was created using the neighbor-joining method (gaps setting: pairwise deletion; distance method: number of differences). Numbers at selected nodes indicate the percentage frequencies of branch association on the basis of 1,000 bootstrap repetitions. The scale bar indicates the number of residue changes. Asterisks indicate predicted proteins; brackets denote subfamilies in vertebrates. Species: Caenorhabditis elegans (nematode); Ciona intestinalis (sea squirt); Drosophila melanogaster (fruit fly); Danio rerio (zebrafish); Gallus gallus (chicken); Homo sapiens (human); Mus musculus (mouse); Pan troglodytes (chimpanzee); Rattus norvegicus (rat); Xenopus laevis and Xenopus tropicalis (frog). 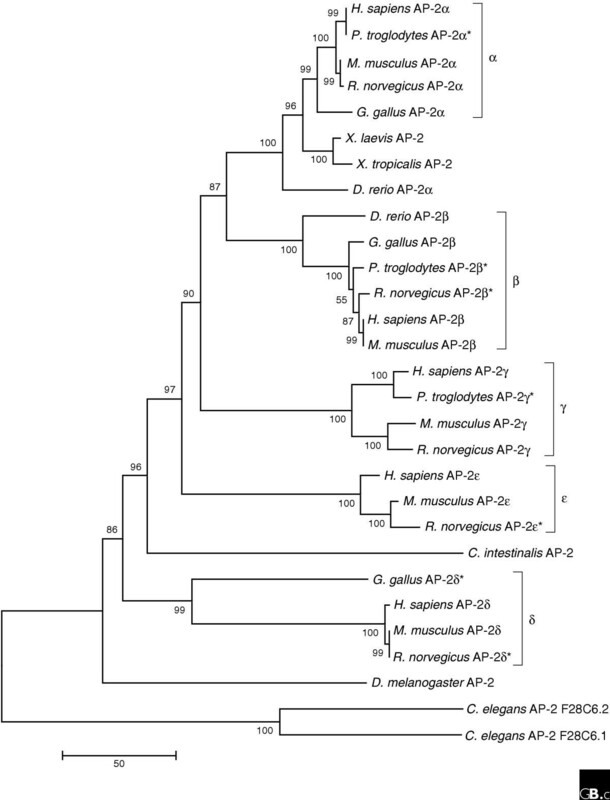 In the genome of the protochordate Ciona intestinalis a single AP-2 gene has been predicted; the phylogenetic tree shows that the protein evolved before the split of the AP-2α, AP-2β, AP-2γ and AP-2ε proteins, with the highest sequence similarity with the AP-2α group, suggesting that AP-2α might be most similar to the ancestor of AP-2 proteins. This hypothesis is further supported by the conserved epithelial expression patterns of murine AP-2α, Xenopus AP-2  and the amphioxus and lamprey AP-2 genes. As expected, the two Caenorhabditis elegans and the single Drosophila melanogaster AP-2 proteins show the weakest phylogenetic relationship with vertebrate and protochordate AP-2 transcription factors; they form an outgroup to the other AP-2 family members (Figure 1). Given that no AP-2 gene has been identified in yeast, the family probably originated late in evolution and expanded considerably in the vertebrates. All AP-2 proteins share a highly conserved helix-span-helix dimerization motif at the carboxyl terminus, followed by a central basic region and a less conserved domain rich in proline and glutamine at the amino terminus (Figure 2). The proteins are able to form hetero- as well as homodimers. The helix-span-helix motif together with the basic region mediates DNA binding [9, 10], and the proline- and glutamine-rich region is responsible for transactivation. AP-2 has been shown to bind to the palindromic consensus sequence 5'-GCCN3GGC-3', found in various cellular and viral enhancers (reviewed in ); a binding-site selection assay in vitro also revealed the additional binding motifs 5'-GCCN3GGC-3', 5'-GCCN4GGC-3' and 5'-GCCN3/4GGG-3' . Other binding sites differing from these sequence motifs, for example, the SV40 enhancer element 5'-CCCCAGGC-3' , indicate that AP-2 proteins may bind to a range of G/C-rich elements with variable affinities. Target genes with AP-2-binding sites in their promoter sequences are involved in biological processes such as cell growth and differentiation and include, for example, those encoding insulin-like growth factor binding protein 5 (IGF-BP5) with the binding site 5'-GCCAGGGGC-3' , prothymosin-α (5'-GCCGGTGGGC-3')  and the estrogen receptor (5'-GCCTGCGGGG-3') . A schematic representation of the protein structure of an AP-2α dimer, showing the proline- and glutamine (P/Q)-rich transactivation domain (89 amino acids, red), the PY motif within this domain (5 amino acids, green), the basic domain (20 amino acids, yellow) and the helix-span-helix motif (131 amino acids, blue). 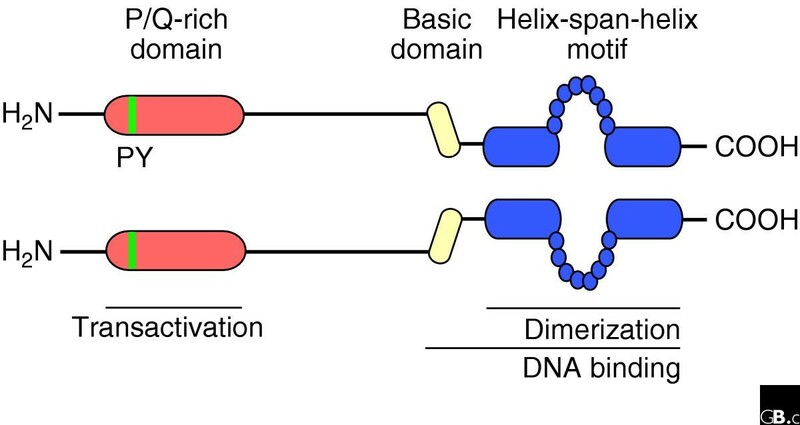 The helix-span-helix motif is responsible for dimerization of the proteins and mediates DNA binding together with the basic domain. Modified from SwissProt, ID: P34056 . Most AP-2 proteins have a PY motif (XPPXY) and other highly conserved critical residues in the transactivation domain; by contrast, the PY motif is missing in AP-2δ but the amino- and carboxy-terminal ends of the core sequence of the transactivation domain are still conserved. In addition, the binding affinity of AP-2δ to conserved AP-2-binding sites is much lower than that of other AP-2 proteins . This suggests that AP-2δ might transactivate genes in vivo by a different mechanism from that used by other AP-2 proteins, probably through interactions with a novel group of coactivators and through a different affinity for AP-2-binding sites. Alternatively, AP-2δ might act as a negative regulator, inhibiting or modulating the transactivation capability or DNA-binding affinity of the other AP-2 family members. The crystal structure of the AP-2 proteins has not yet been solved. AP-2 transcription factors are localized predominantly in the nucleus, where they bind to target sequences and regulate transcription of target genes. AP-2 proteins have also been shown to interfere with other signal transduction pathways; for example, it has been proposed that they modulate the pathway downstream of the developmental signaling molecule Wnt by associating with the Adenomatous polyposis coli (APC) tumor suppressor protein in the nucleus . The activity of AP-2 proteins can be controlled at multiple levels: their transactivation potential, their DNA binding, their subcellular localization [17–19] and their degradation [20, 21] can all be modified. Mechanisms of regulation include post-translational modifications, such as protein kinase A-mediated phosphorylation [22, 23], sumoylation  and redox regulation [25, 26], as well as physical interaction with various proteins (see Table 3 for a comprehensive list). Interacting proteins either modulate the activity of AP-2 proteins or are influenced in their function by binding to AP-2 proteins. *Abbreviations: DBD, DNA-binding domain; DD, dimerization domain; n.d., not determined. †It is currently not entirely clear whether Rb binds AP-2 only via the amino terminus , or whether the DNA-binding domain is also necessary . The tissue distribution and developmental functions of AP-2 transcription factors have been studied extensively in several species. Drosophila AP-2 (dAP-2) is expressed in the maxillary segment and neural structures during embryogenesis, and in the central nervous system (CNS) and the leg, antennal and labial imaginal disks during larval development [27, 28]. Mutation of the dAP-2 gene leads to defects in proboscis development and leg-joint formation [29, 30]. The multiple overlapping and diverging expression patterns of AP-2 family proteins suggest that, following the expansion of the family during vertebrate evolution, redundant and non-redundant functions of the individual AP-2 family members evolved. Although the single AP-2 protein in the cephalochordate amphioxus is expressed mainly in non-neuronal ectoderm, in the lamprey, a primitive vertebrate, AP-2 has co-opted a second expression domain, the neural crest . The single AP-2 homolog described so far in Xenopus is expressed in the epidermis and neural crest and has been shown to be critical for the development of these structures [7, 31–33]. In zebrafish, the two AP-2 family members, tfap2a and tfap2b , are coexpressed in the neural tube, the ectoderm and the pronephric ducts of the developing kidney, but only tfap2a is expressed in neural crest cells [35, 36]. Positional cloning revealed that the zebrafish point mutants named mont blanc  and lockjaw  encode tfap2a; the mutant animals display impaired development of neural-crest derivatives, such as the facial skeleton, the peripheral nervous system and pigment cells [37, 38]. It is also interesting to note that AP-2 proteins are expressed in the primitive ectoderm of both invertebrates and vertebrates, suggesting an evolutionarily conserved role for the family in the formation of this tissue. In mice, three of the five AP-2 family members (AP-2α, AP-2β and AP-2γ) are coexpressed in neural-crest cells, the peripheral nervous system, facial and limb mesenchyme, various epithelia of the developing embryo and the extraembryonic trophectoderm [2, 39–41]. AP-2δ expression is restricted mainly to the developing heart, CNS and retina , whereas AP-2ε expression is detected in cells of the olfactory bulb [3, 4]. Despite the overlapping expression patterns of AP-2α, AP-2β and AP-2γ, disruption of these AP-2 genes reveals non-redundant roles during development. Mutation of AP-2α predominantly affects the cranial neural crest and the limb mesenchyme, leading to disturbances of facial and limb development in a manner reminiscent of the defects described in dAP2 mutant flies [42, 43]. AP-2β and AP-2γ, on the other hand, are essential for kidney development [44, 45] or placentation of the embryo [46, 47], respectively. In humans, mutations generating a dominant negative allele of AP-2β have been shown to be the cause of Char syndrome (Online Mendelian Inheritance in Man (OMIM) ID 169100 ); the hallmarks of this syndrome are patent ductus arteriosus (abnormal persistence of a normal fetal heart structure after birth) with facial dysmorphism and abnormal fifth digits [49, 50]. Comparing all mutant phenotypes, it can be seen that loss of AP-2 transcription factor activity generally impairs proliferation and induces premature differentiation and/or apoptosis in various cell types during development. This conclusion is further substantiated by results from a screen for AP-2α target genes  and supported by gain-of-function studies in Xenopus and mice [31, 52, 53]. As uncontrolled proliferation leads to malignancies, AP-2 transcription factors are not only implicated in normal development, but also seem to be involved in cellular neoplasia, and enhanced AP-2 levels have been reported in various types of cancer [19, 54–60]. In a murine breast-cancer model, tumor progression is enhanced after transgenic overexpression of AP-2γ . Thus, AP-2 proteins can be viewed as gatekeepers controlling the balance between proliferation and differentiation during embryogenesis. The lethal phenotypes of the AP-2 mutants generated so far have precluded an analysis of the roles of AP-2 transcription factors in adult tissues. We and others are currently exploiting the power of conditional mouse mutants to overcome these restrictions [61–63]. Such approaches will not only shed light on normal AP-2 functions but will probably also lead to unique insights into human disorders. Complementary approaches currently include the identification of AP-2 target genes; this might give a better understanding of developmental disturbances and pave the way to novel treatment options [51, 64]. At the molecular level, one major challenge will be the identification of specific AP-2 homo- or hetero-dimeric complexes bound to a particular promoter and the identification of the specific properties of each complex with respect to gene regulation. Also, the signaling pathways responsible for induction of AP-2 genes are currently under investigation. A cross-species comparison of the various AP-2 promoters may give insights into the evolution of tissue specificity and help to determine important enhancer elements. Moreover, given that CpG islands are present in AP-2 promoters, epigenetic regulation such as DNA methylation also needs to be considered. AP-2 transcription factors are currently being studied extensively in human cancer, and they may be of diagnostic value, as has been demonstrated for mammary or testicular carcinoma [19, 54, 56, 65, 66]. It is tempting to speculate that AP-2 transcription factors might not only be molecular markers for certain types of cancer, but could also be causally involved in their etiologies and would therefore represent a potential target for therapeutic intervention. We thank Roland Dosch and Michael Pankratz for critical reading of the manuscript. This work was supported by funding from the Deutsche Forschungsgemeinschaft (# 503/6 and 503/7) that was awarded to H.S.